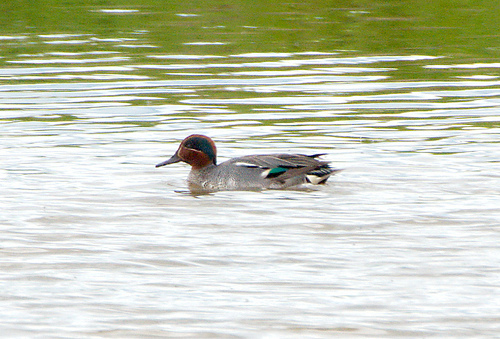 The Teal is a small duck that occasionally breeds in western Europe. It is however mostly seen in winter. The head with red and green on it characterizes the male. The Teal is not doing very well; its numbers are diminishing in western Europe. The Teal is a small duck with a green spot on a red head. The Teal lacks the orange stripe on top of the crown. 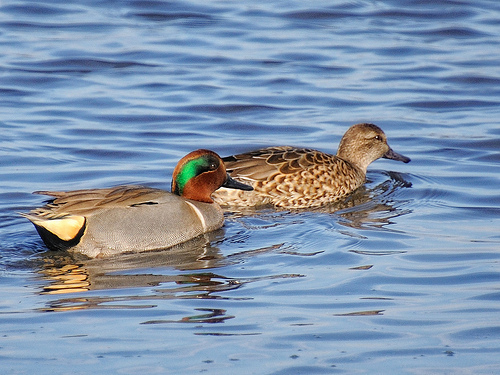 The head of the Teal is red with a green spot, the Garganey has a brown head with a white stripe. The Teal has a brown chest. The Pochard has a black chest.